"Manufacturer & Exporter: We can develop any design as per your artwork & offer the products with High Quality at reasonable. So we kindly request you to forward your inquiries to kathir@blazeknit.in, info@blazeknit.in, "
Fashionista = Vintage-nista, Thrift-nista, high end, high street... FABULOUS! O yes, and full time blogger. Well Hello New Year! I welcome you with open arms. Furry ones. 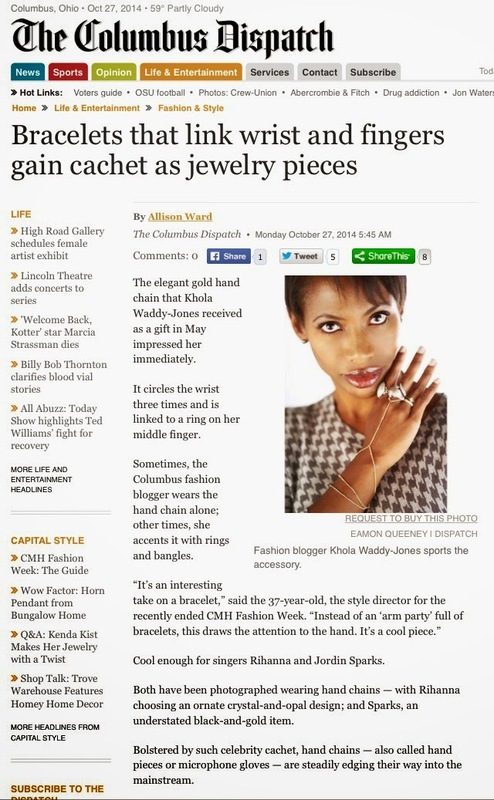 Hand Chains, The Columbus Dispatch & Me. Be sure to pick today's newspaper for my feature on the popularity of hand chains. Hello, my name is Sola Zheng, fashion marketing and sourcing freelancer based in Shanghai, China. I have been involved in the fashion and art scene for a few years, apart from fashion design and marketing, my hobby also includes oil painting, and I have worked for a gallery in the past. As a former fashion design student and fashion marketer, I have realized how challenging it can be for young independent designers to develop their collections. Not only do you have to develop your brand yourself but you also have to develop an efficient and cost-effective production strategy that allows you to develop your aesthetic/brand in a sustainable manner. I have been interested in the fashion industry for years and I particularly love working with people who bring an interesting vision and different concepts into the market. Thus, I decided to create a position for myself where I would offer my services to young designers who need in help of a production partner. With my background in design and art, I have received training in textiles, shapes, colours and other necessary skills needed to oversee the production of designs. And with my marketing knowledge, I will be capable of offering various production options from the most cost-effective to the most time-saving strategies. For example, when the production sample is too small for manufacturers, I can instead contact local tailors who on top of being skilled artisans are very inexpensive here in China. And should you have any concern of your designs and patterns being copied, I can assure you that my production partners will all sign a confidentiality agreement to protect your brand. If you are interested in collaborating please contact me and we can further talk about your needs, expectations or discuss concerns you may have about the process. As a fashionista yourself you too may meet aspiring designers with great style and vision but unsure where to begin, we can help them.